The more than 10,000 tons of garbage that New York City produces a day are taking a rising toll—in higher municipal spending, the city’s carbon footprint, burdens on neighborhoods and impact on landfill communities from upstate to Kentucky. Can New York come up with a better way to take out the trash? 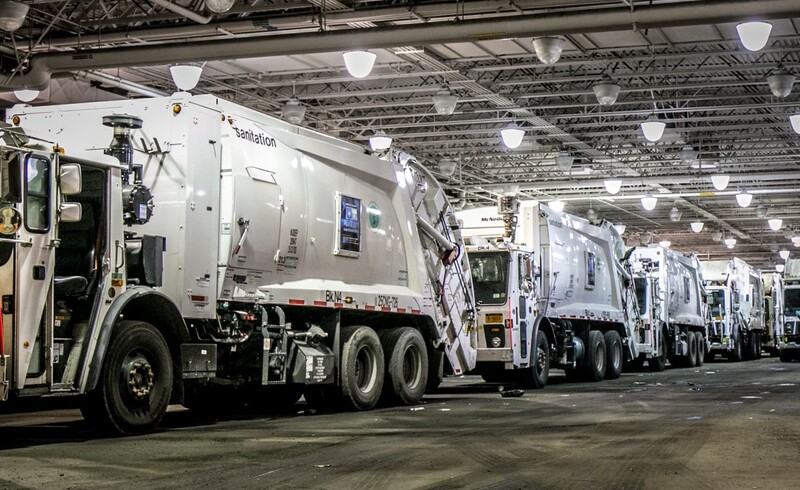 Sanitation trucks parked at a New York City of Department of Sanitation facility on Varick Avenue in Brooklyn. Mayor de Blasio has proposed ambitious reforms to address some of the problems caused by the 6 million tons of trash New Yorkers produce each year. But the way to a better waste system will not be easy. Waste from New York’s businesses is not picked up by DSNY but by a industry of for-profit companies who, critics say, serve inefficient routes and treat their workers poorly. Seattle, Boulder and Ljubljana (that’s in Slovenia) have employed approaches that New York City might find instructive as it chases Mayor de Blasio’s “zero waste to landfills” goal. From upstate Seneca County to the banks of the Delaware River, people who live near landfills and trash-burning energy plants are parsing Mayor de Blasio’s “zero waste” pledge—and taking action to reduce the impact of our trash on their lives. The scene at the former Fresh Kills landfill, of beautiful scenery built about decades of bad trash policy, gives reason for optimism that the city will find a way to deal with the rising costs of managing waste. But it will take a change in mindset, not just policy. A multimedia look at the past, present and future of waste in New York City. A spokesman for the industry that picks up commercial waste in the city, which is under fire over labor practices and environmental impact, says private carters have a record to be proud of.